Pizza night happens once a week at our house. It’s been a tradition for as long as I can remember, but it hasn’t always been homemade. I used to think homemade was too hard to make or something I couldn’t learn how to do. After stepping outside of my box, and overcoming the decision that it was too hard, I started with a yeasted recipe by Peter Reinheart from his book The Bread Bakers Apprentice. Basic at it’s best, and with a nice long rise time, it’s a recipe I returned to again and again because it just tastes so darn good and the techniques are solid. When I started making Homemade Sourdough Bread, well, that changed everything about my pizza making process. Sourdough is a whole other beast, but I leaned hard on the skills I learned from making yeasted pizza dough and applied it to sourdough pizza with a few tweaks. I’ve yet to share those two recipes on the blog because I was thwarted with having to go gluten free. I find out soon if I need to stay the course, but until then I got to work right away on a gluten free pizza recipe and posted a Gluten Free Pizza Crust last week. Now, I’m following it up with a favorite Easy Homemade Pizza Sauce. Seriously easy. 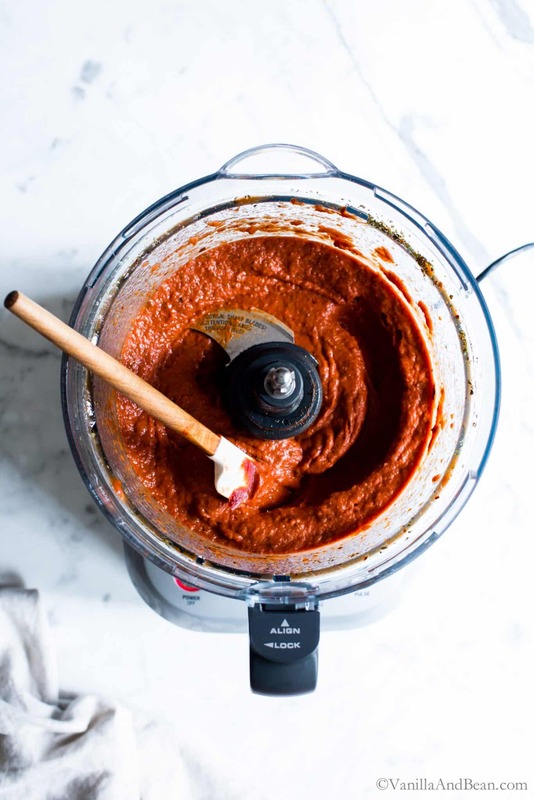 Start with tomato paste and toss it in a food processor or blender. Add garlic cloves, olive oil, spices and water. Give the ingredients a whirl and you’ve got pizza sauce! 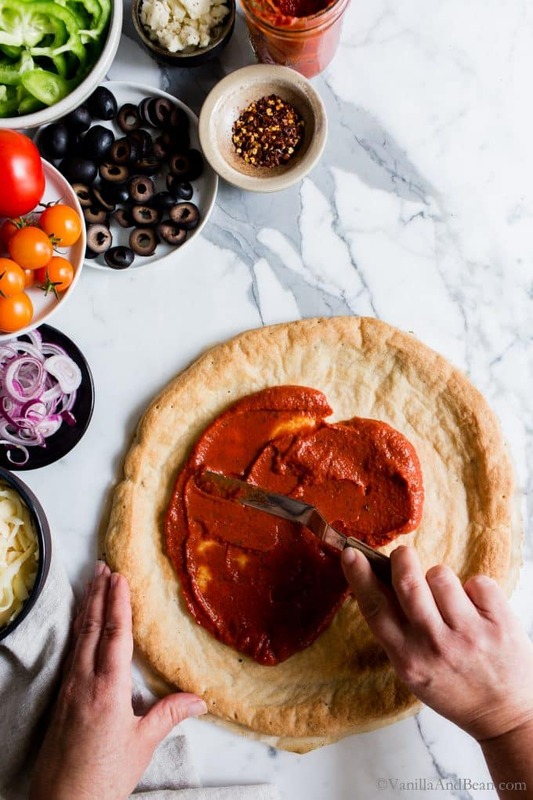 Can you believe how quick and easy this pizza sauce is? And soooo goood! 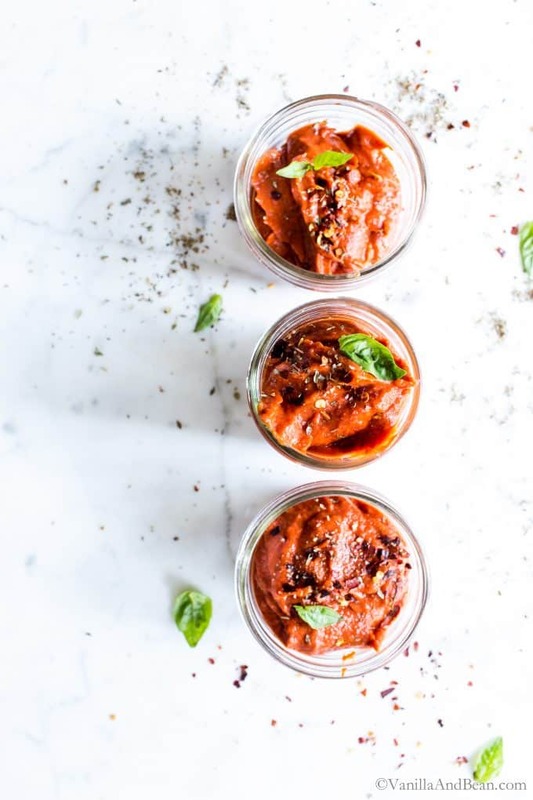 Get your favorite tomato paste for this recipe. I like Muir Glen. 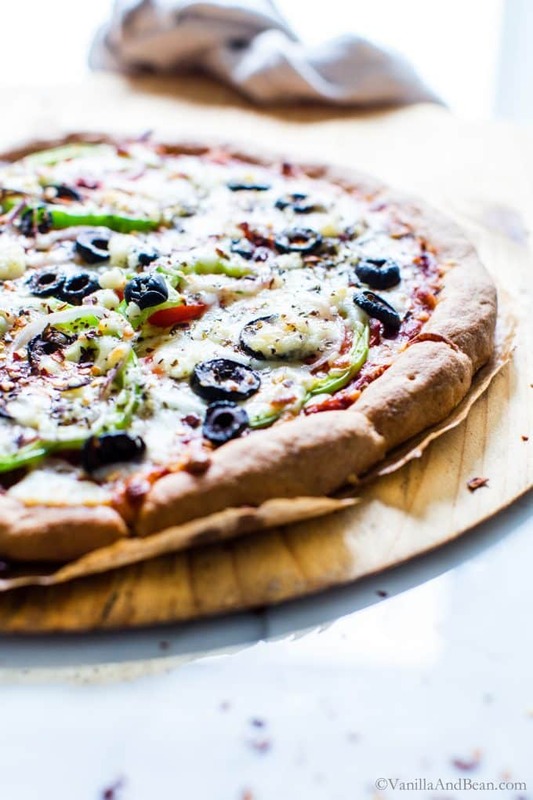 Make a single or double batch – I typically make a double batch and freeze the rest for our next pizza making night. A single batch makes enough for 3, 10″ pizzas. I included a single and double recipe below. Take the spicy up by adding an additional 1/4 tsp red pepper flakes to the mix. Freezer Friendly? Yes please, up to two months. 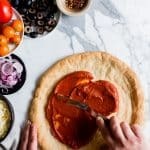 Once you’ve made Homemade Pizza Sauce, how about giving this Greek Pizza or Gluten Free Pizza Crust a go? 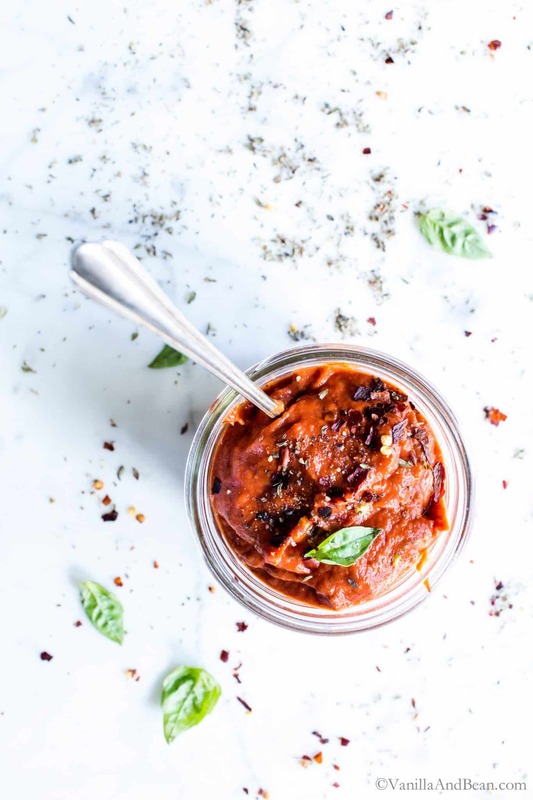 Homemade Pizza Sauce quick to whip up and so simple to make with pantry staples. It's freezer friendly too! 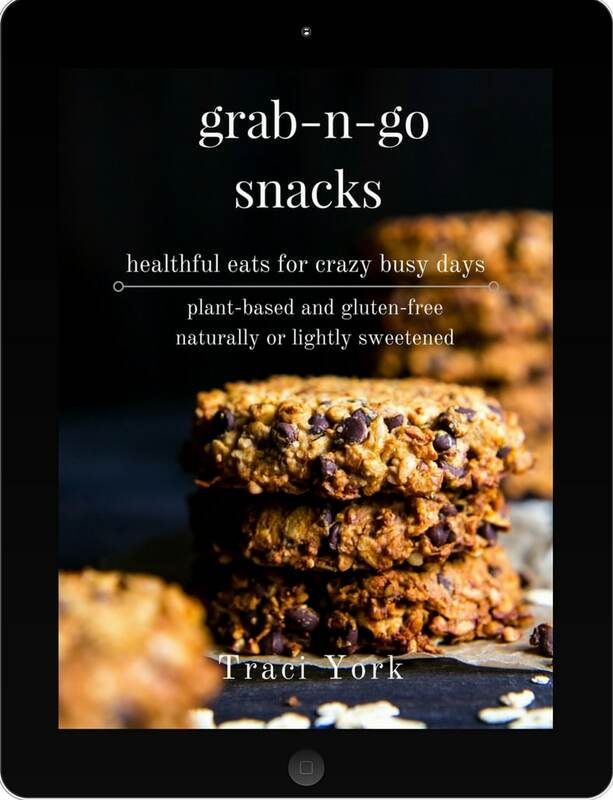 vegan + gluten free *Make a single or double batch! A single batch makes enough for 3, 10" pizzas. A double batch makes enough for 6, 10" pizzas (hello freezer friendly). 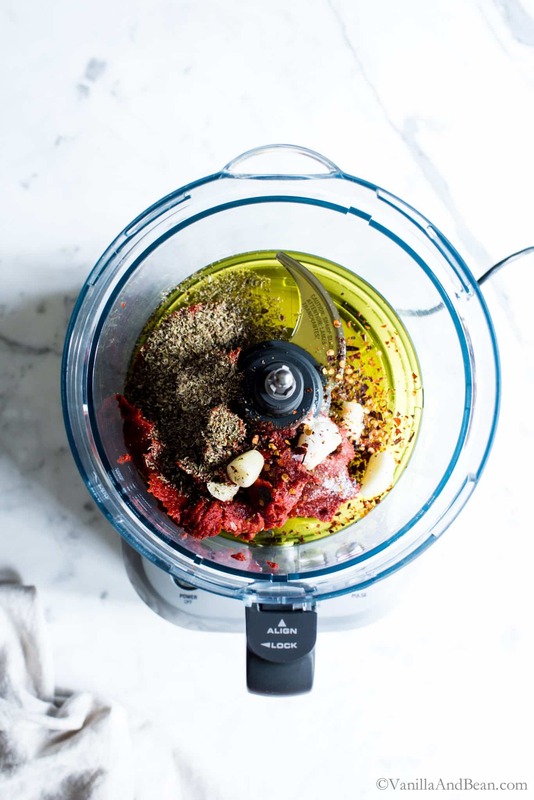 In a food processor (fitted with S blade) or blender, spoon in the tomato paste. Add the garlic, salt, oregano, chili flakes, and olive oil. Process for about 30 seconds. Scrape down sides of the bowl, and process again drizzling in all but about 2 Tbs of water. Process for another 30 seconds or until the sauce is smooth. Taste for salt and check for consistency. If a thinner sauce is desired add the remaining water or more if needed. It should be about as thick as mayo. The sauce is now ready to slather all over your pizza crust! Store in a lidded container in the refrigerator for up to three days or in the freezer for up to two months. Thaw in the fridge overnight for use the next day. Very similar to mine, and it’s delicious. I will try this one next time. Wow, I never thought to use tomato paste as the key ingredient in tomato sauce – but you are so right on this, Traci. It makes for a thicker sauce with more flavor then just regular tomato sauce. So quick and easy too! You’ll love how easy and rich it is Geraldine! Your sauce looks lovely! 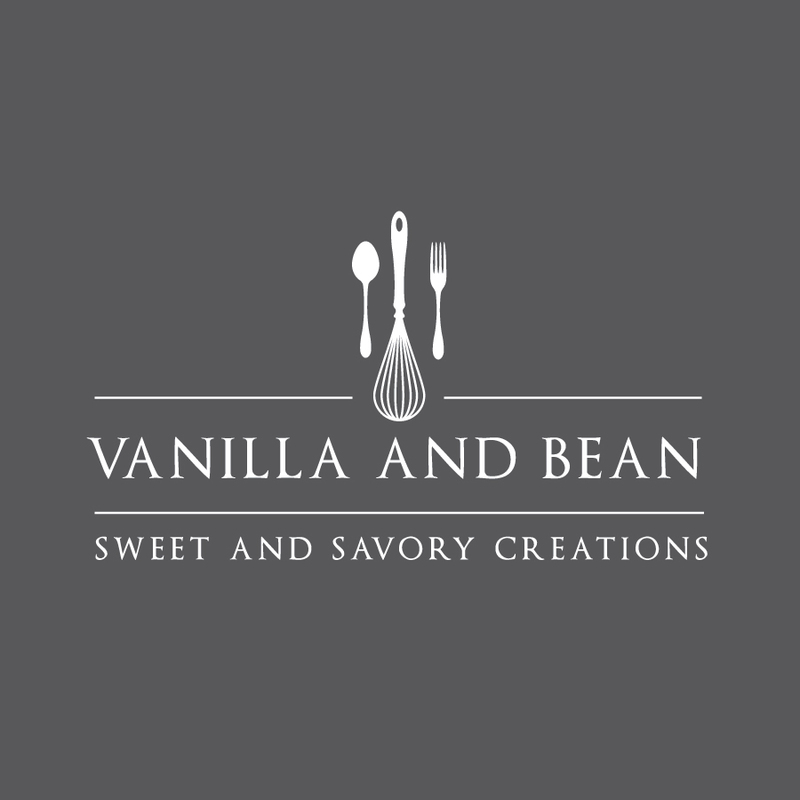 I am sure it tastes just as good as I have tried several of your recipes and they have all been fantastic. Do you have any recommendations for reducing or eliminating the amount of oil in this recipe? Hi Samantha! Thank you for your note and kind words! So happy you’re enjoying the blog. Although the oil makes this sauce extra rich and thick, feel free to eliminate it. You probably won’t need as much water as the recipe calls for however, so drizzle in the water until desired consistency. I hope this helps and you enjoy the recipe!